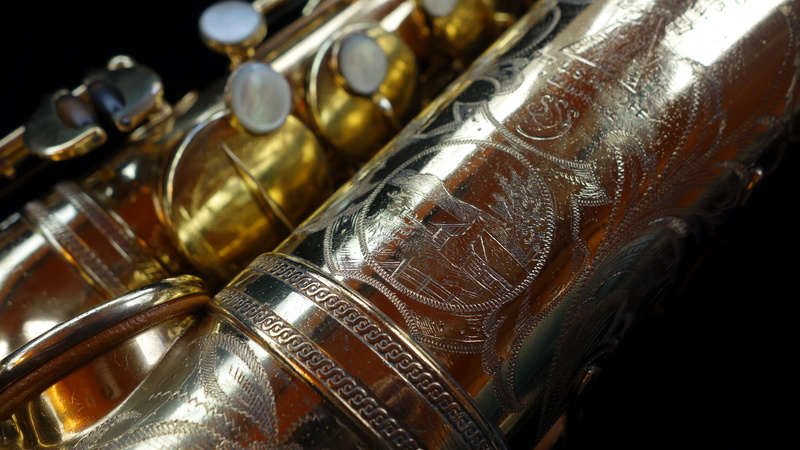 This is a Selmer Radio Improved model alto saxophone in burnished gold plate with the American style engraving. 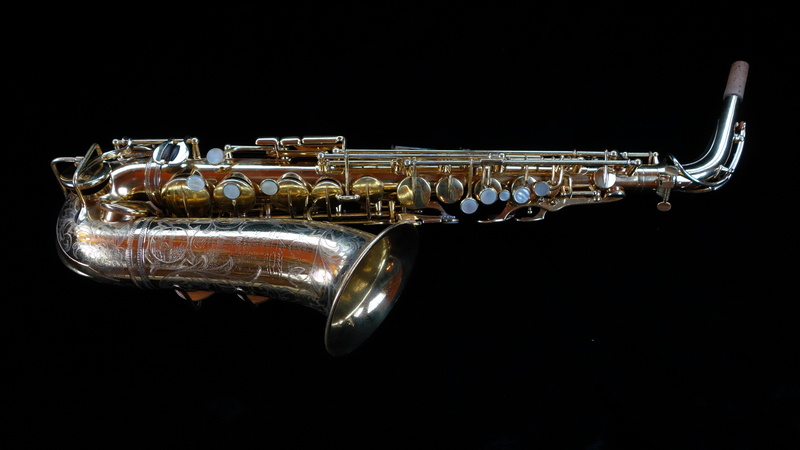 This is one of probably between two and five saxophones of this model ever made with this finish and engraving pattern, and likely the only saxophone with this exact engraving scene as they were typically a little different from one to the next. 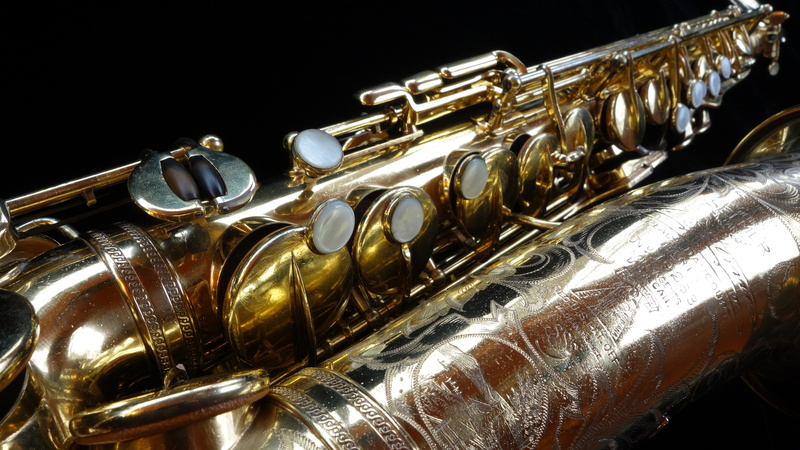 The burnished finish is different from regular gold plate, and was typically the absolute top-of-the-line finish from any saxophone maker. It involved hours of hand-burnishing (polishing by rubbing it with a very very smooth and hard piece of metal or sometimes a mineral. Pretty interesting stuff, look it up!) and the plating is typically much thicker than a normal gold plate finish. 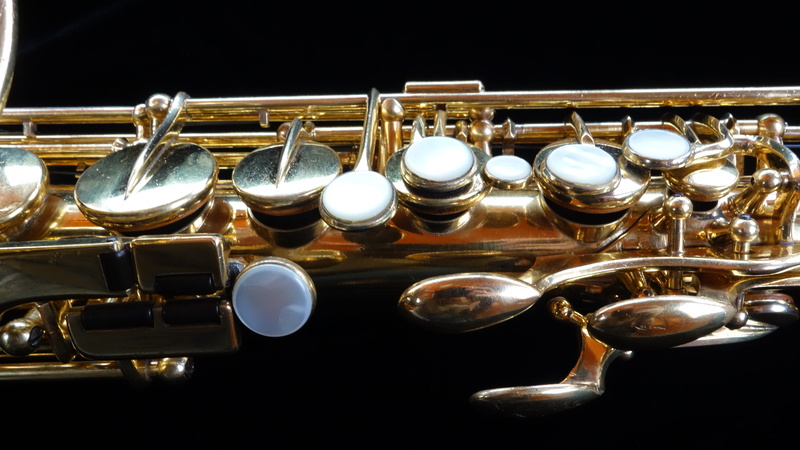 This was a whale of a job- while in good physical condition with its original finish, it was clear that this saxophone had been played a lot and a full mechanical rebuild was in order. Several pearls were replaced, and I remade the G# pearl holder (which has been removed at some point and replaced with a rather crude spatula) and installed a new pearl. Also the key guards had been resoldered at some point in the past, and cleaning that up, straightening them all out, and redoing it as best as I could took a fair bit of time. She cleaned up nice, I think. 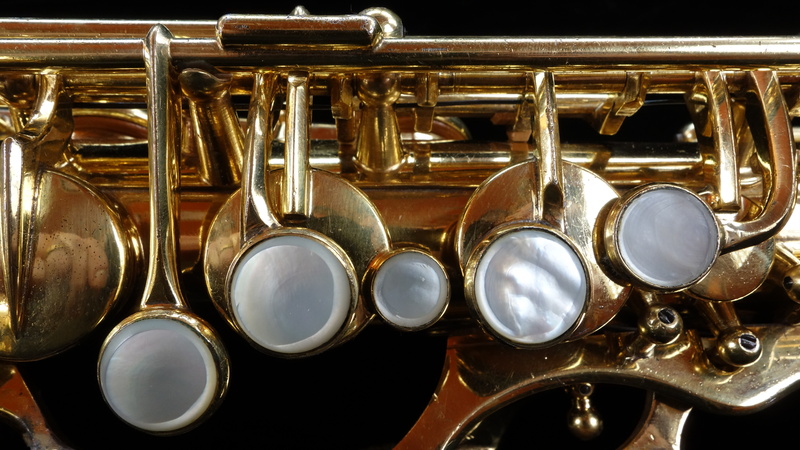 Horn played great, as you might expect. What a beauty! Here is the G# pearl holder and pearl. Hopefully you wouldn’t be able to tell it was replaced without me telling you!